After, Facebook open sourced Thrift Technology (an internally used tool by Facebook) in 2007, rival entity Twitter brings Diffy, an internal Twitter service to the world. 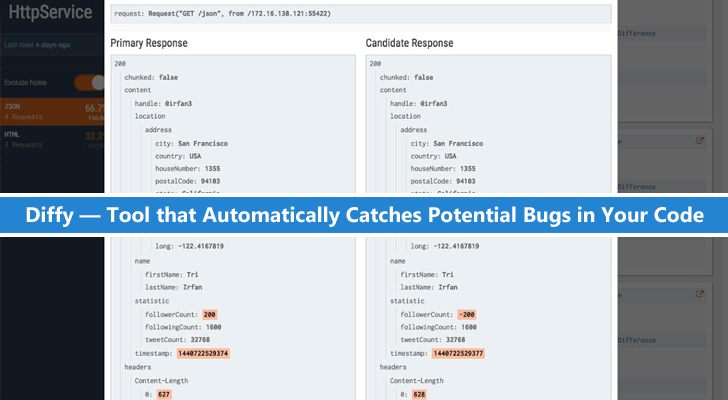 Yesterday, Twitter introduced "Diffy," an open source tool, acting as a helping hand for the software developers to catch bugs, test and compare results without writing much code. Diffy plays a vital part in Twitter's development. As a service - Twitter modifies portions of its complex code on a timely basis, and Diffy is packed with such advanced automated techniques that it helps Twitter in its smooth workflow and optimized performance. Diffy simultaneously relieves programmers from writing separate codes to test flaws in the modified code. As, Diffy's minimal setup requirements are adaptable to any kind of environment. Apache Thrift and HTTP-based communication are such elaborate environments where Diffy catches bugs automatically. But, What exactly Diffy is? Diffy surely finds bugs, but by comparing instances of your new and old code side by side and acting as a proxy and multicasting requests it receives to each of the running instances, Diffy reports for any regressions gathered from these comparisons. "The premise for Diffy is that if two implementations of the service return 'similar' responses for a sufficiently large and diverse set of requests, then [both the] implementations can be treated as equivalent, and the newer implementation is regression-free," said Puneet Khanduri, a member of Twitter's tools and frameworks team. Diffy's highlighted feature is its modern noise cancelation technique, which is considered as a niche element when measured to other comparison based regression analysis tools. You can avail Diffy's service @ Github, also take a glimpse of what Puneet Khanduri has to say in Twitter's official blog.